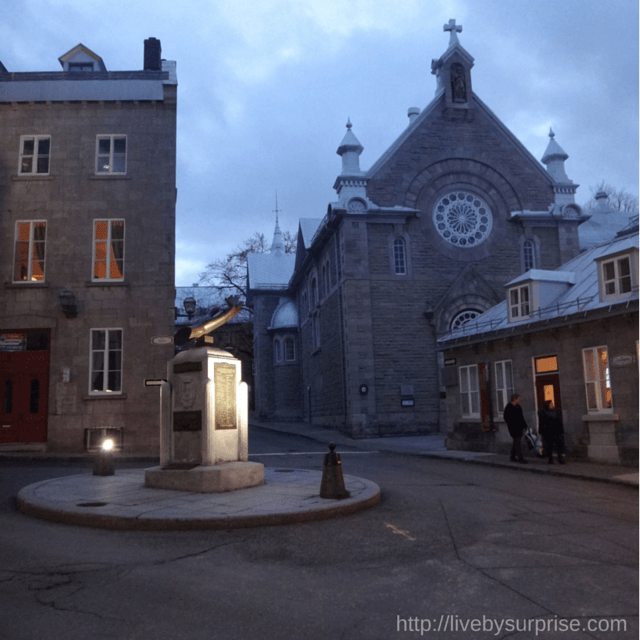 In November, 2015, Hubs and I took a trip to Québec City, Canada. We’d spent a weekend down there five years before—our first weekend away together. Our second trip, this November, was to celebrate five years together. Québec City is the capital of the Canadian province of Québec. The town has a distinctly European feel—more so than any other city I’ve ever been in North America. Wikipedia tells me that it has the second highest population in the province after Montreal. I haven’t been to Montreal since I was in college, but I can tell you that Québec City certainly felt a lot less metropolitan. We walked many a street filled with signs that read “a louer” (French for “for rent”). The City’s name is reflective of the Algonquin word Kébec, meaning “where the river narrows” – referencing the narrowing of the St. Lawrence River, which cuts through the old and newer parts of the city. Our hotel was a small building within the ramparts of Old Québec (Vieux-Québec) had a view of the river. Although it was late in the season, the Hotel was actually quite full for the weekend. The city is a tourist destination year round as people come to enjoy the quaint European streets both in the summer and under the snow. As they are tourist friendly, all of the shopkeepers and wait staff we spoke to easily transitioned between both official languages – speaking in English as we identified ourselves. 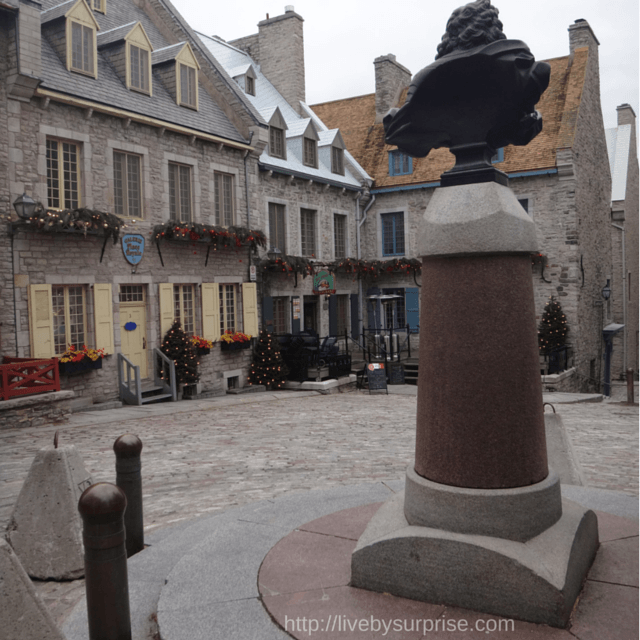 Old Québec is the only remaining North American city with fortified walls. In the older parts of the City, the roads are still lined with cobblestone. Hubs and I did some shopping, but for the most part, we walked the streets, sampled the foods and enjoyed the city. The croissants were some of the freshest and most delicate I’ve ever had. There was a lot of maple syrup and duck liver. And of course, poutine – french fries covered with cheese curds and gravy (even sold at the local McDonalds). Despite our hotel being quite full, the streets were, for the most part, fairly empty, as you can see from this photo of a local church. There are a lot of quaint little shops selling Canadian novelties like beaver fur, inukshuks, and (my favorite), maple syrup. Many of the stores (more than I remember from last time) now seem dedicated to the regular tourist tchotchkes, hats and shirts. But there were still a number of shops with unique, handmade items. I found a lovely hand knit scarf and hat. And there was (of course) a store that sold items with bears and moose – I got some pajamas for Bae and myself, and Hubs got a long-sleeved T. The quaint streets were ready for Christmas tourism – lights, trees, and other Christmas decorations signaled the start of the season. Québec City is one of the oldest European settlements in North America. French explorer Jacques Cartier built a fort at the site in 1535, where he stayed for the winter, returning to France in the spring. Intent on building a permanent settlement, Jaques returned in 1541, but the settlement was abandoned less than a year later, mostly because the natives were hostile – but also because of the long, harsh winter. In 1608, Québec (the city) was founded by a French explorer and diplomat. The town was eventually ceded to the British in 1768, and the city played a role in the War of 1812. The town is separated into the “Upper” and “Lower” portions by geography. The streets in the lower city wind down treacherously, and you have the choice of walking or taking the Funicular (pictured above) – a hill climbing elevator, for a few Canadian dollars. I really can’t imagine what it’s like in the winter – although we did note several sections of sidewalk had handrails installed. I can only imagine that the town uses a great deal of snow melting technology to avoid injury. 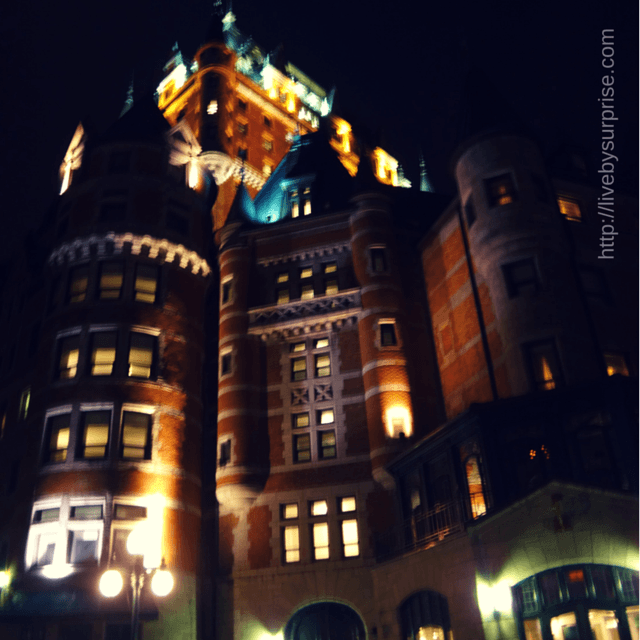 The Château Frontenac is a grand hotel that dominates the cities skyline, currently operated by the Fairmont Hotel group. The hotel looks like something out of J.K. Rowling’s imagination. We didn’t stay – but we did stop in for the famous Sunday Brunch buffet. The room holding the buffet was roughly the size of two basketball courts. It held large tables of every breakfast delicacy you could imagine. Croissants, pancakes, eggs, smoked salmon, duck liver, a selection of regional cheeses. There was even a large table of candy and other treats for the children. Hubs and I also made a stop at the City’s Museum of Civilization. 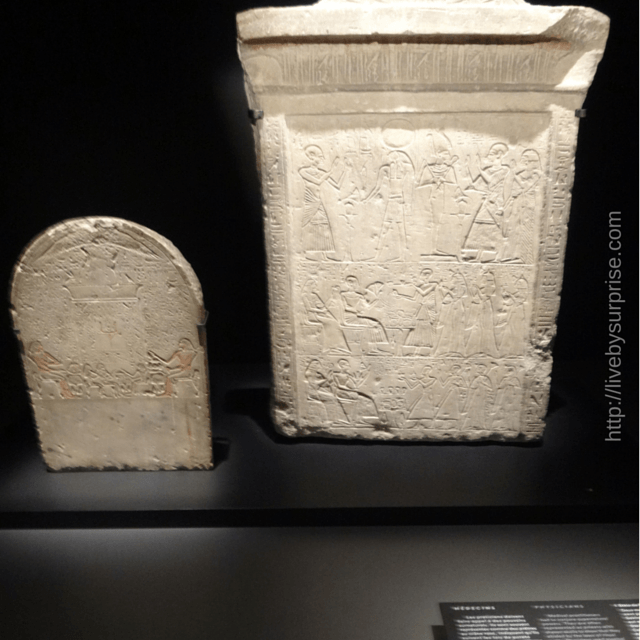 The museum was hosting a special Egyptian exhibit—and amusingly, many of the pieces (including the stone below) were from the Rijksmuseum in the Netherlands. They also had a rather large exhibit of carriages—and I learned that the term “station wagon” did not originate, as I had assumed, in the seventies. Instead – a “station wagon” referred to a carriage that was sent to the rail station by the local hotel to pick up guests. They also had a fascinating exhibit on modern dance. They had fairly sophisticated RFID technology set up to a headset – and as you moved about the room, your headphones would pick up the music from the nearest screen. Some were on walls – but there were multiple screen surrounds with a set of benches in the middle. It was fascinating. 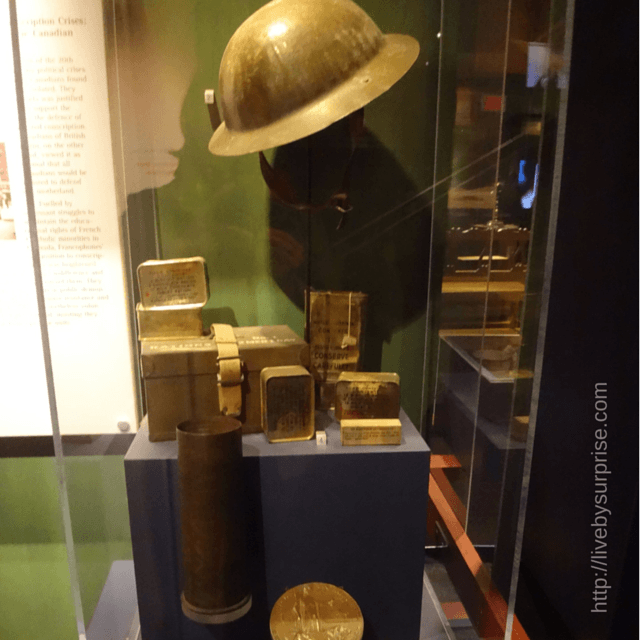 And, as our trip was very close to Veterans Day – I took a moment to reflect on the exhibit piece with gear from a Canadian soldier. I had a great uncle who settled in the Canadian province of Alberta who died in World War I. We had a lovely time, enjoying the tiny cobbled streets and the host of artisan shops and fine foods. If you’re close enough to make the trip, and can’t afford a trip to Europe – this is definitely a good choice. I’ve never been to Canada, but my daughter and I are planning a family trip that includes visiting. Just not sure where yet. This seems a beautiful city. A best to celebrate love. Canada is such an amazing place to visit! I love it! Looks lovely! I’ve never been to Canada, but I have always heard great things about it. Now I miss Canada! Great article. This has been on my bucket list for some time. I almost got to cross it off one year, but, alas, the trip was cancelled at the last minute. After reading this piece, I’m going! One of my very favorite Canadian cities! You captured it perfectly. It is lovely – our Sunday brunch was amazing. Might have to rethink my #SayNoToCanada policy after reading this :). You should. It’s just beautiful there. I would love to visit there someday. I’ve never been to Canada before. Wow! All the different places you’ve been and you’ve never made it to Canada? It’s fantastic. You need to add it to the list. I know of the moose pajamas you speak of! And I love them. I’m so intrigued by poutine at McDonald’s and how it compares.. to poutine at a lovely little cafe. I don’t think I’ve ever actually had poutine. Looks a little too gross. And for that reason I wouldn’t even try the McDonalds version. Great info on a beautiful city, Liv! Although I’m a fellow Canadian I haven’t had the pleasure of visiting Quebec city. Lovely photos and historic tid bits you’ve shared here. I imagine it’s beautiful at christmas with the snow and lights. I think that’s where they build the ice hotel? Thanks for the lovely tour, Liv!! Yes – I imagine you’re a bit too far away to make a car trip! Ooooh FRIST! And a history lesson I actually enjoyed! THANK YOU! It sounds like a beautiful city. I looked at the first pic and thought it looked a little like Winchester, but then the pics with the church are far more Frenchish. What a beautiful weekend though 🙂 Love it. You’re welcome! If you’re ever back out this side of the pond you should put it on your list. I’m tempted 🙂 I’ll have to let you know.